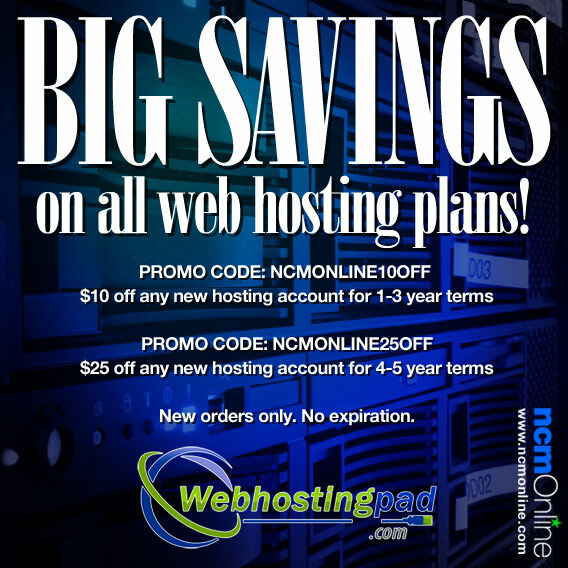 Shop now and receive $10 off any Web Hosting Pad 1-3 year term web hosting plan. Use promo code NCMONLINE10OFF in your cart when you order. Shop now and receive $25 off any Web Hosting Pad 4-5 year term web hosting plan. Promotional discounts valid on new web hosting plan orders only and do not apply to established hosting accounts, hosting renewals, domain name purchases, domain name renewals, or new or renewing “add-on” services. Discounted services renew at regular rates. These offers may be withdrawn by Web Hosting Pad at any time without prior notice. Certain elements of this page: © 2005-2015 Web Hosting Pad All rights reserved.